Two hikes in one day? Who says no. After we finished our hike in the red part of Tatacoa Desert, we didn't know any better, than to catch a tuk-tuk and drive to Los Hoyos, where the gray desert is located. 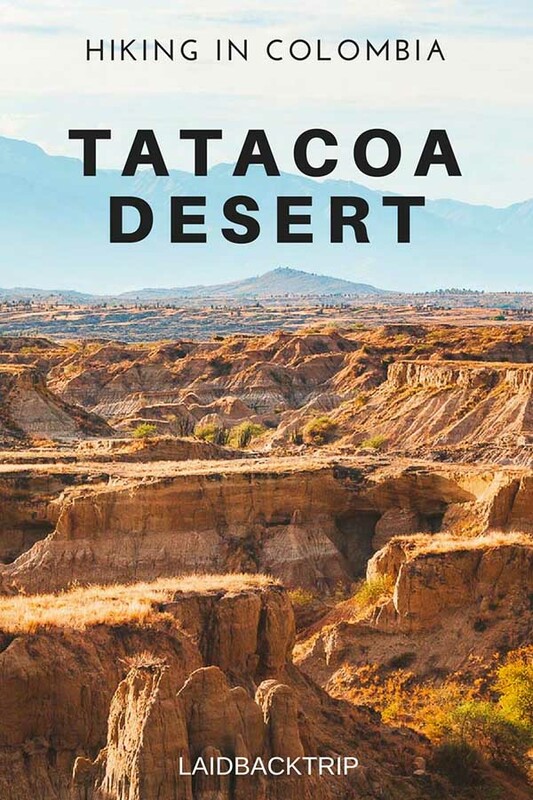 Yes, the Tatacoa desert is split into two parts, a red area of Cuzco and a gray area of Los Hoyos. It's an 8 km ride from Cuzco, and the driver will wait for you for an hour or two, depending on your previous agreement and the price you are willing to pay. If you think that two hours are not enough for exploring the desert, pay the driver for one way and catch someone else on the way back. I have to admit, that I haven't done any proper research before going to Tatacoa Desert, so when Lucie asked me an innocent question when are we going to visit the gray desert, I was a little bit surprised but acted like I know what she was talking about and replied: "Yeah, we can go right now". So after 20 minutes of a dusty ride, we finally arrived in the other desert and started our second hike of the day. Ok, now comes the embarrassing part where we got lost, again. There is another nice loop you can walk, and it starts from Estadero Los Hoyos, but we didn't know that, so we asked our driver to drop us off at the piscina, where the trail ends. There is a parking lot simply called Parqueadero Los Hoyos, and from there it's a short walk to the swimming pools. Our Travel Tip: If you like to take a dip into one of the three really small artificially built swimming pools behind an ugly fence, don't forget to bring your swimsuit (and COP 8000). So after we passed by the artificial swimming pool area, we carried on for at least half an hour until we asked ourselves, ok we haven't seen anyone except for few horses and cows and the trail looks more like a dry riverbed than the well-maintained path for tourists, did we get lost again? We decided to climb one of the large mounds using a narrow path, probably used by animals, and got a sense of the vastness of this stunning place. What we saw was essentially a thread of canyons creating a magnificent maze stretching as far as we could see. I'm not sure how far you can go but make sure you remember the way out. It would be a long night with the snakes and scorpions crawling all around you. Our Travel Tip: Hat, sunscreen, and water are a must. And if it's been raining, you are going to need sturdy boots as the trail gets muddy quickly. It seemed like we could go on forever but it was time for us to return. On the sweaty way back, we made a couple of short detours, which were dead ends, but it showed us, how much time you can spend here just by exploring the place. And a last look at the gray desert. After a long day hiking, we felt pretty tired and got back to the red desert just in time to buy ourselves a treat, couple of freshly squeezed jugo naturales with ice, and then sat on the edge of the canyon and watched the calm desert as the last sun rays of the day were hitting the tallest of the rock formations. The red desert is the main attraction in the area, which comes with a huge drawback, it gets quickly crowded. The gray desert, on the other hand, is less popular and this fact makes a perfect place of retreat, well except for the piscina, which is the main attraction here. But leisurely stroll a bit further away from the piscina, and you will find yourself in a quiet world surrounded by surreal formations and breathtaking landscape. Are you looking for accommodation in the desert? You have two options, make a reservation by a phone if you want to stay in the desert or if you're a looking for more comfortable stay, book one of the hotels in a nearby town Villavieja.